You may use anything from this mod provided it was made by me although credit would be nice. For all other resources please check with the modders concerned (unless it is a modders resource in the first place). You may not upload this to SteamWorkshop (or to any other site) without my permission or do anything to change the esp and reupload it. If you want to translate the mod that's fine, but please let me know first. In light of recent changes to Valve and Steam workshop and Paying for mods. My mods are free to download and will remain so. I do not give my permission for my mods to be uploaded to Steam Workshop or uploaded for Gaming Consols. This is not me being PC elitist. I don't own a gaming consol so I can't troubleshoot, maintain the mod or in any way be helpful to a user - if someone wants to do all that they are welcome to get in touch with me and ask to do so. I do not under any circumstances give my permission for any assets I personally have made for this mod to be used in a mod which then charges users money to download them. Other permissions remain as listed at the bottom of this page. 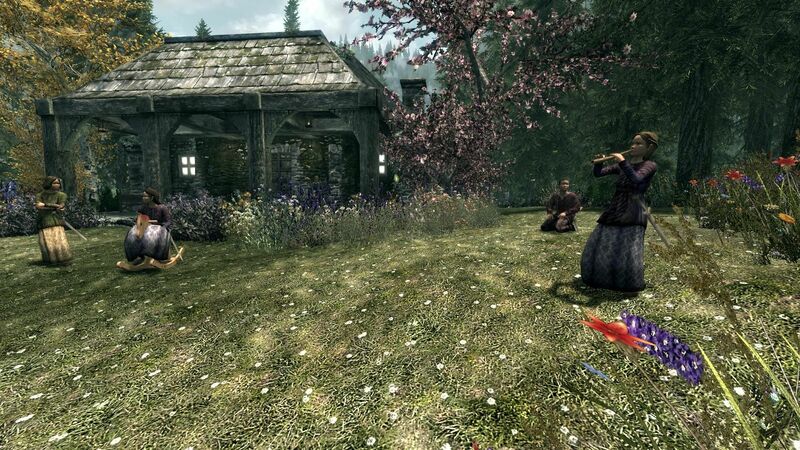 This Version of my mod requires Hearthfire DLC. 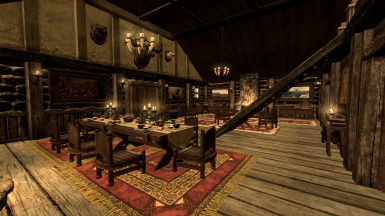 Located in rural Eastmarch just behind Cradlecrush rock and midway between Whiterun and Windhelm this free house and farm is a small distance off the main road. Fast travel is either to the front door or to the farm area close to the stable block. The house contains a total of fourteen rooms and an additional galleried balcony. It is reasonably lore friendly but does have plumbed water. Decorated throughout in noble style the house has a lot of decoration and clutter but nearly all of it is statics. Much of what looks like clutter or decoration is actually themed storage. It is fully navmeshed and follower friendly and comfortably sleeps 9 followers. 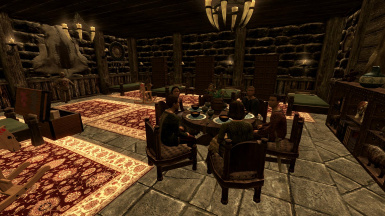 The house would suit a player who likes rural life in beautiful scenery in a property which accomodates followers and who appreciates crafting, mining and being able to grow and harvest their own food, the house is fully staffed so it never feels totally empty. The staff are not recruitable (by choice - I like to come home to a lived-in home). 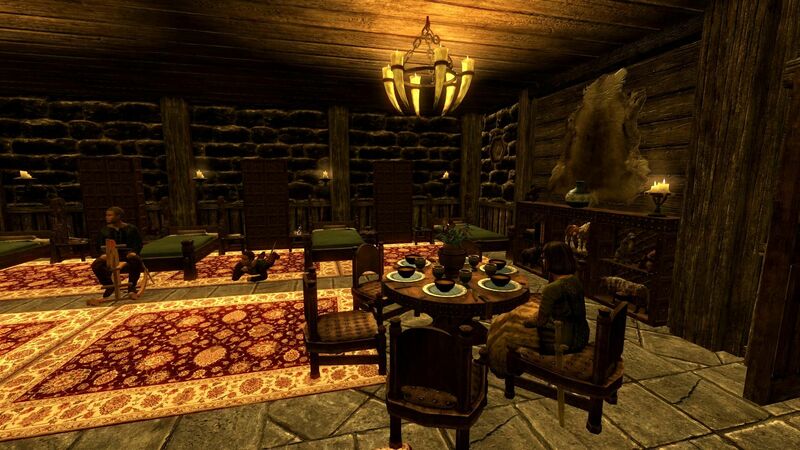 This mod will ensure your spouse and children will move in and use the house as a home. The children will go outside to play and your spouse will go in and out throughout the day and sleep in the master bed (the one nearest the window in the master bedroom). 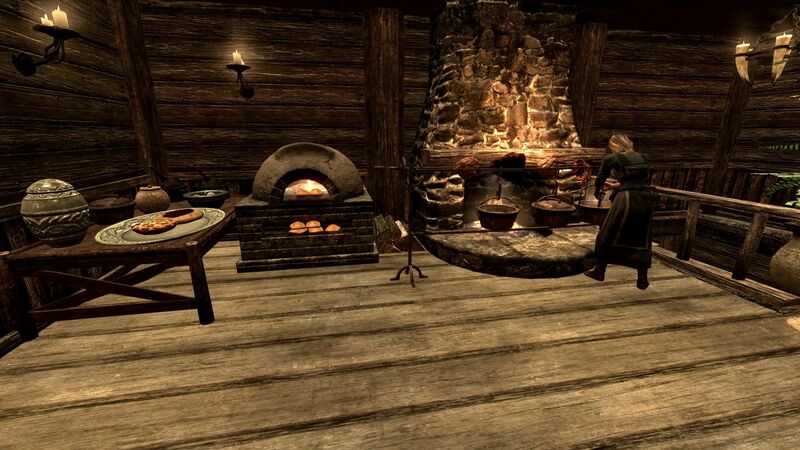 There is a hearthfire crafting oven. The cows are milkable and produce a jug of milk and cream daily. Hovver the cursor over their flank and press E, the animation will take over. There are chickens for eggs and bee hives for honey. Also a farm well and grain mill. In addition it has all the crafting that was in the original mod. Your followers will undress to use the bath and will redress as they exit the area and before they get to the bathroom door. 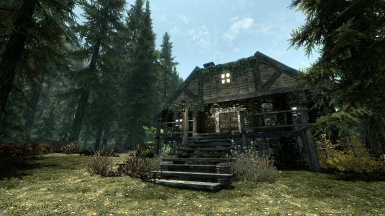 In this version the house has been put onto a full day/night cycle. It looks beautiful indoors at dawn and dusk when the early morning sun shines in, in the evenings the lights come on and at night it gets darker. 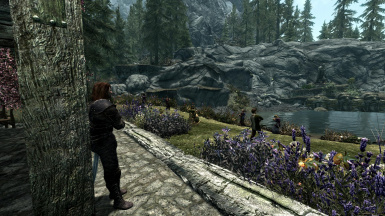 It will conflict with any mod which alters the landscape near Cradlecrush rock or any other house in the same spot. If for any reason the house seems darker in the day than usual just go outside and come back in. that will fix the issue for you after adding those lines save the files and reload the game and it should be sorted. 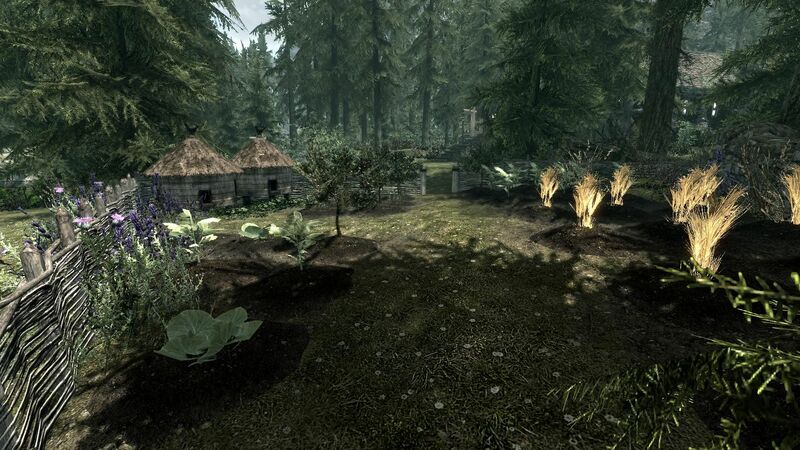 Place Candle Pond Ranch Hearthfire.esp and Candle Pond Ranch Hearthfire.bsa in your data folder at steam/steamapps/common/skyrim. Check that Candle Pond is ticked in the launcher. Move your spouse, followers and children out of the house and set another house as their home, remove all goods that you want to keep. Remove the esp and bsa from you data folder. 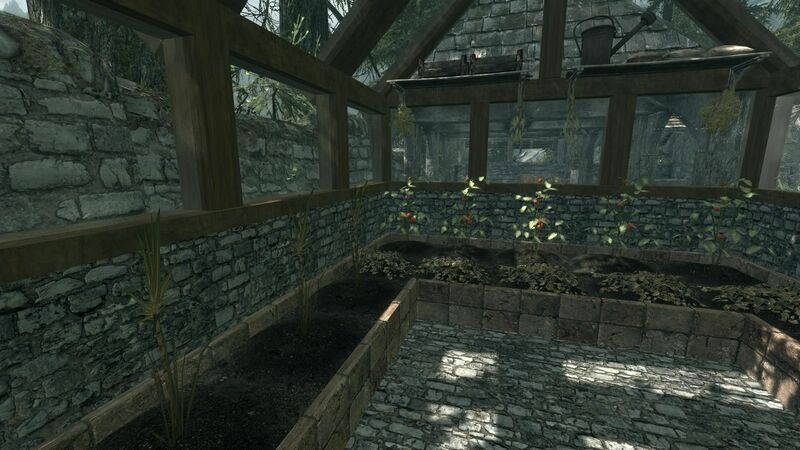 Gives the choice of more plants for the hearthfire planting mounds, things like tomatoes and apple trees can now be grown and a lot of extras depending on which version you use. 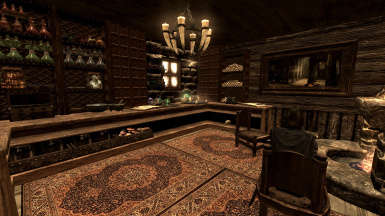 Stops the annoying unequiping of a mannequin's inventory if you are absent from the house for more than a day or two and fixes them in place. Please follow his installation instructions completely if you want it to run correctly.